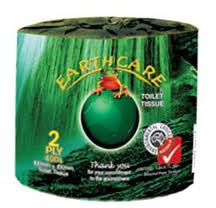 Earthcare Toilet paper, Earthcare paper towels, Earthcare tissues, Earthcare serviettes, Earthcare cleaning products. Earthcare paper products are made from recycled paper and are oxygen bleached not chlorine bleached. Great quality paper products that are strong and white. Earthcare cleaning products are ultra concentrated so a little goes a long way. Earthcare Toilet Paper. ABC Tissue policy on plastic wrapping: ABC Tissue Products (NZ) Ltd is always looking at different ways to care for the Earth in our manufacturing process. ABC Tissue worked with a film supplier to produce a multi layered film product that is much thinner than normal, reducing plastic resin by more than 27%. We have chosen this low weight durable material over paper wrapping to provide stronger protection during transportation and stock handling, hence minimising wastage of resources. The plastic material used is under Plastic Identification Class No. 4 (also called LDPE - low density polyethylene); over 50% of recycling plants now have facilities for the recycling of this material. Although this is not often recycled through curbside programs it will biodegrade in a compost bin or we recommend recycling the plastic wrapper via collection bins found in major supermarkets. If it does, however, find its way to a landfill, it is good to know that it will breakdown much faster than thicker plastic film wrappers. 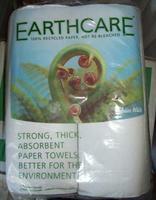 Earthcare Slimfold Paper Towels. 20.5 x 23.5cm. Earthcare toilet rolls. Made from 100% recycled paper. 400sheet 2ply. Polybundle 4 x 12pack (48rolls). Earthcare Centrefeed paper towels are made from 100% recycled paper. A light abrasive, general purpose cleaning paste. Apply Cleaning Paste in a gentle circular motion with a damp sponge or cloth then rinse throughly. Always test on a small sample surface to ensure results are acceptable. Deep manual cleaning for: Bathrooms, Janitorial areas, Toilets. Great on Stainless Steel surfaces. 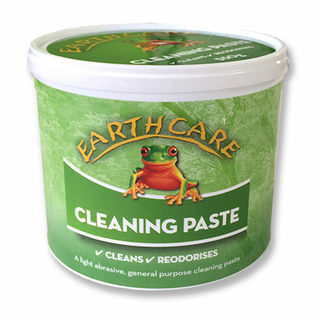 Earthcare Cleaning Products are ultra concentrated environmentally friendly commercial grade cleaning products. Heavy Duty Degreaser can be dispensed with a simple hand plunger or diluted through automatic dilution equipment or a multidose wall mounted system. Use as a Spray and Wipe, spray onto surface then wipe with clean cloth or paper towel - dilute 1:38 (2 plunges to 750ml). Use as a Floor Cleaner, Wet mop onto floor and allow to dry - dilute 1:99 (5 plunges to 5L bucket). Neutral Multi-Purpose Cleaner can be dispensed with a simple hand plunger or diluted through automatic dilution equipment or a multidose wall mounted system. Use as a Floor Cleaner, Wet mop onto floor and allow to dry - dilute 1:99 (5 plunge to 5L bucket). Earthcare Catering Serviettes are made from 100% recycled paper. 315mm x 310mm, white. Carton 2400sheets (24 x 100sh). Bathroom Cleaner can be dispensed with a simple hand plunger or diluted through automatic dilution equipment or a multidose wall mounted system. Use as a Toilet Cleaner, Swirl around bowl and rim. Leave for 10-15mins, flush, scrub if needed - dilute 1:9 (10 plunges to 1L). Use as a Floor Cleaner, Wet mop onto floor and allow to dry - dilute 1:500 (1 plunge to 5L bucket). A smooth and creamy lather that cleans hands well and keeps them soft and supple. Has brilliant conditioning properties. Meets or exceeds EU biodegradability standards. Earthcare facial tissues in cubes. Made from 100% recycled paper. Cube holds 90 tissues. Great economy for hotels and motels. Earthcare interleaf tissue paper is soft and white. 2ply. Made from 100% recycled paper. Carton holds 9000sh (36 packs of 250sheets). 1 ply Jumbo toilet rolls. Made from 100% recycled paper, soft, strong and white. 2 ply Jumbo Toilet Rolls. Made from 100% recycled paper. If you order 15 or more bundles of these we can send them freight free (rural excl), please ask us to invoice direct. Earthcare Kitchen Towels are made from 100% recycled paper. Each paper towel holds 65 sheets. 2 rolls per pack. 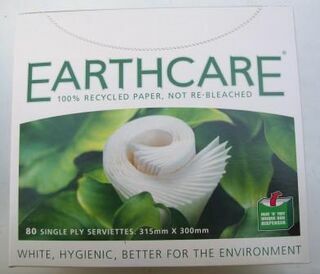 Earthcare Serviettes 1ply white, made from 100% recycled paper. Made in New Zealand. 2ply Tissues made from 100% recycled paper, soft, strong and white. 2ply Tissues made from 100% recycled paper, soft, strong and white. 4 different box designs inside carton. Earthcare 1ply 850sheet toilet rolls. Made from 100% recycled paper. 12 packets of 4 rolls (total 48 rolls). Toilet paper rolls made from 100% recycled paper. SOFT, strong and white. Individually Wrapped. Outer paper and core are domestically and commercially compostable. No plastic wrapping used with this toilet paper. Toilet paper rolls made from 100% recycled paper. SOFT, strong and white. Wrapped. Outer paper and core are compostable.